For quick answers to your questions about Holland, click on one or more of the Frequently-Asked Questions (FAQ) below. If you don’t see a question pertinent to your query, contact us by phone or email and we will be happy to help. Our contact information is listed on the bottom of this page. Where is the Visitors Bureau office located? The Holland Visitors Bureau is located in downtown Holland at 78 East 8th Street. Click on the Maps & Transportation page for directions to our office. Our office is open Monday through Friday from 8:00 a.m. - 5:30 p.m., Saturdays 10:00 a.m. - 5:00 p.m., and Sundays 10:00 a.m. - 4:00 p.m. In the busy summer months, our hours are extended to 6:00 p.m. on weekdays. If you happen to miss us, there are brochures and maps available in racks outside of our office and an electronic events calendar posted in our window. A majority of Holland Area hotels are located on or near US 31 on the east side of Holland between 32nd Street and Riley Avenue. CityFlats is located right downtown, as well as Courtyard by Marriott Holland Downtown. Haworth Inn & Conference Center is located downtown on the campus of Hope College. The Lake Ranch is located on Lake Macatawa near the Holland State Park and is open seasonally. Tulip Time begins the first Saturday of May each year and the event lasts eight days. For more information, click on their website here. Are there any hotel rooms available during Tulip Time? Of course! Holland has more than 1,500 hotel rooms available year-round in a variety of styles and price ranges. Call our office anytime to get information on which lodging properties have rooms available on the dates you plan to stay. We can help you find a room to suit your taste and budget. What is there to do in Holland on Sunday? A lot! Holland’s Dutch attractions are open on Sundays from late April to mid-October. There are also numerous opportunities for outdoor recreation such biking, kayak/canoe rentals, hiking, and swimming. 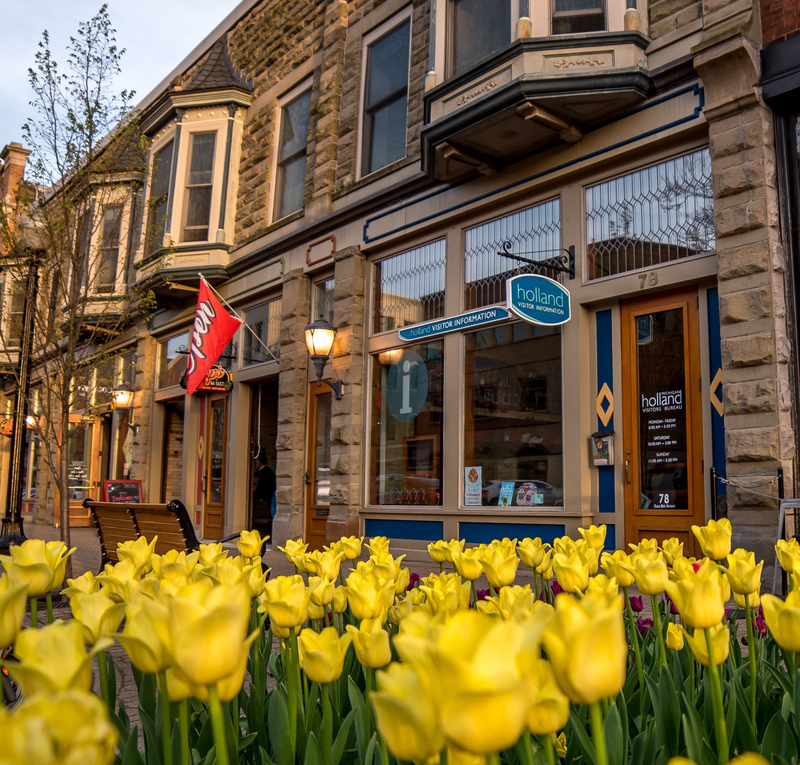 A select number of downtown shops and restaurants are also open on Sundays, and the Holland Visitors Bureau is open on Sundays with seasonal hours. A list of downtown Holland shops and restaurants open on Sundays is also available at the Visitors Bureau.